At on the prettiest points in Yorkshire's Wharf Valley, the tiny village of Appletreewick is home to a couple of riverside pubs, a small shop and an exceptional campsite just a short stroll down the lane. Find out about it, and other great local sites, in this hand-picked camping collection. Rustic England in a nutshell, the Duke of Devonshire's Yorkshire Dales' estate of Bolton Abbey is a thoroughly charming place fora camping holiday. With 30,000 acres of rolling countryside and woodland and over 80 miles of footpaths, the place is a camper's delight. Find the best campsites near Bolton Abbey here. If you plan on settling in Settle then there's not better choice than one of the North Yorkshire town's local campsites, set on the western edge of the Yorkshire Dales National Park. Our hand-picked collection of campsites is a great place to start your adventure planning. Just south of the bucket-and-spade resort of Scarborough, the smaller town of Filey offers a quieter way to explore the North Yorkshire coast, with a host of good campsites in the local area. Find the best of them today, with Cool Camping's carefully selected collection of top campsites. Grassington, main village in Wharfedale in the Yorkshire Dales, has a cobbled Georgian centre full of handsome old stone buildings sloping up a hill. Check out Cool Camping's short-listed collection of recommended campsites and plan your own Yorkshire adventure today. From the tea rooms, museums and busy streets of Harrogate town, to the surrounding hills of the Yorkshire Dales, Nidderdale Valley and nearby Ripley Castle, the town of Harrogate in North Yorkshire is an ideal focal point for any camping holiday. Find the best campsites in the area with Cool Camping's hand-picked collection. In the heart of the Yorkshire Dales National Park, the pretty village of Hawes – the home of Wensleydale cheese – is the ideal base for hiking, biking and camping holidays in the North Yorkshire national park. Find the best campsites near Hawes here. Whether you're here to hike the Yorkshire three peaks of Whernside, Ingleborough and Pen-y-ghent or you plan to catch the train instead and ride across the 440-yard-long Ribblehead Viaduct, you'll find plenty of good campsites near Horton-in-Ribblesdale. Find our choice collection of the very best, with the Cool Camping collection. On the western edge of the Yorkshire Dales, the unassuming village of Ingleton is home to one of the best short walks in the national park, up to Thornton Force waterfall and past a series of other spouts, falls, plunge pools and panoramic viewpoints. Find the best local campsites in the area, with our pick of the best Ingleton campsites. In the very heart of the Yorkshire Dales National Park, few places can match Kettlewell for a prime North Yorkshire location. There are a number of good local campsites, ranging from right in the village to a few miles down the lane. Browse our short-listed collection and plan your Yorkshire Dales adventure today. Tumbling down to the River Nidd, the North Yorkshire market town of Knaresborough is a delightful stopping point on any camping holiday. There are plenty of good campsites nearby, with only the very best making our Cool Camping short-list. Probably the most popular hiking destination in the Yorkshire Dales, the small village of Malham an unmissable camping destination – if you've never seen Malham Cove or Gordale Scar, you definitely should – and there are plenty of places to pitch nearby. Find the best with Cool Camping's dedicated campsite collection. On the south-east edge of the Yorkshire Dales National Park, the lesser known Nidderdale AONB seems purpose-made for camping holidays, with the riverside village of Pateley Bridge the perfect place to base yourself. Find the best local campsites with Cool Camping's choice selection. There's no doubt that, for campers, the Yorkshire town of Pickering is really a gateway into the treasure trove of the North York Moors beyond, which splays into the distance in a maze of wild footpaths and mountain biking trails. Find the best campsites in the area with our dedicated, hand-picked collection of Pickering campsites. From the handsome market place to the medieval castle that overlooks it, the pretty North Yorkshire town of Richmond is a fantastic family attraction. There are plenty of campsites within striking distance of the town, with the very best of them making the Cool Camping short-list. Ripon makes a pleasing base for any camping holiday, with a host of good pubs, restaurants, shops and cafés in town, as well as an impressive, Gothic cathedral, it makes the ideal rainy day break or place to stock up before heading out to enjoy the great outdoors. There are plenty of campsites close to town, with the very best making it onto our Cool Camping shortlist. The North Yorkshire town of Scarborough is home to all the seaside spectacles you'd expect – beaches, a pretty harbour and a towering, clifftop castle – while, back in land, North Riding Forest Park and the North York Moors are on the doorstep. For camping and glamping it makes the ideal focal point. Find the best campsites in the area here, with Cool Camping's hand-picked short-list of the very best sites. Dominated by its medieval castle, the North Yorkshire town of Skipton is known as the gateway to the Yorkshire Dales and is an ideal base for hikers, bikers and campers to stock up on goods before venturing into the national park. 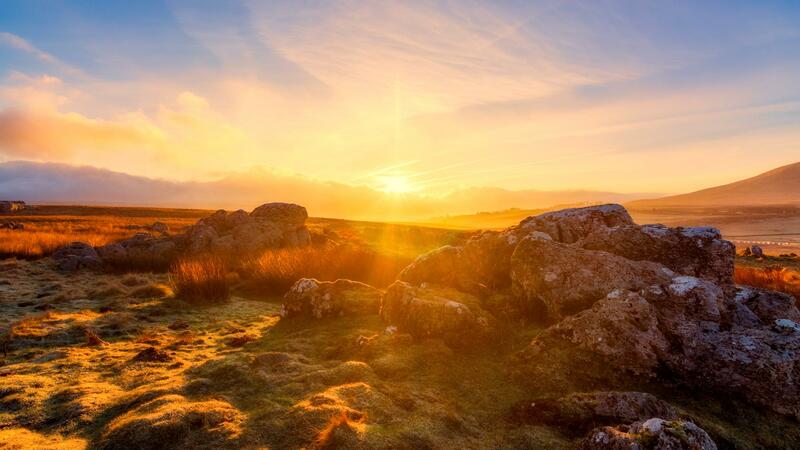 Find the best campsites near Skipton with our hand-picked collection. The jewel of North Yorkshire’s coastal towns, Whitby boasts a long sandy beach, a thriving harbourside, a huddled Georgian old town and a famous abbey on the cliffs above, plus easy access to the North York Moors. Find the best places to pitch nearby, with this collection of hand-picked campsites. The historic city of York is like the de facto capital of northern England, with top-quality museums, busy medieval streets, a vibrant restaurant scene and a slew of independent shops, pubs and cafés. 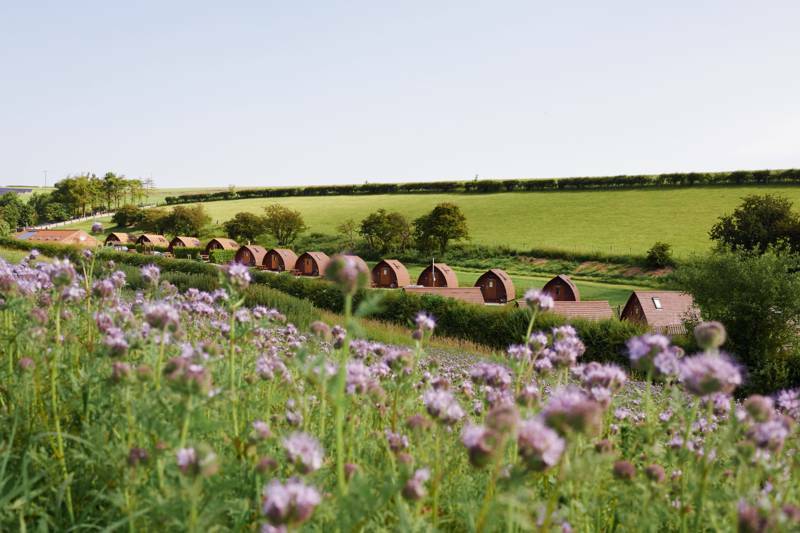 The local surroundings are home to many a good Yorkshire campsite, from family friendly sites to exclusive glamping retreats. Dramatic moorland scenery, the green farmland of the dales and the cliff-backed beaches of the coast make North Yorkshire a great place for outdoor lovers. 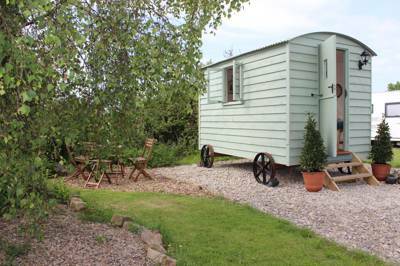 And whether it’s walking, cycling or sightseeing that tempts you to the place that’s dubbed ‘God’s own country’, camping and glamping are the best ways to stay here. You’ll be immersed in the great outdoors from morning to night – waking to the sound of the sky larks soaring above its moors or waves lapping its beaches and falling asleep under vast starry skies. The Cool Camping team has been on the hunt for the best campsites in North Yorkshire and it’s little surprise that the area has come up trumps. There are great glamping pads and perfect places to pitch tents on the coast and in the countryside. So, what are you waiting for? Grab the tent, pull on the walking boots, head to Yorkshire and prepare yourself for a breath of fresh air. There’s no better way to stay in the unspoilt and protected landscapes of North Yorkshire than camping. While glamping and luxury camping opens up the great outdoors to many, we’ve always had a soft spot for classic camping. Whether you’re backpacking on your own, campervanning as a couple or setting up a multi-room tent for the whole family, there’s a sense of achievement about being self-sufficient. Not only that, but classic camping is great value and has a low impact on the environment too. In fact, many of the sites that we give the nod to are places that pop up and pack down in farmers’ fields leaving little trace of their existence in the winter months. If you’re considering staying in one of North Yorkshire’s two national parks, the North York Moors or the Yorkshire Dales, staying in a tent just seems right; both for its green credentials and for the chance to really enjoy all that these special places have to offer. As the parks are popular with walkers, many on long-distance treks like the Coast-to-Coast walk, tent camping is a popular way to stay in the Moors and Dales. It’s also a time-honoured way to stay beside the seaside and there are plenty of coastal campsites to choose from – especially around the larger seaside resorts like Scarborough and Whitby. For the Cool Camping collection, we tend to stay away from the larger more-commercial sites and only select places that offer something a bit special; sometimes it’s a simply stunning location, sometimes it’s a great host and sometimes it’s fabulous facilities. We put the same care and attention in to selecting glamping accommodation that meets with the Cool Camping seal of approval; it’s a tough job but someone’s got to do it! 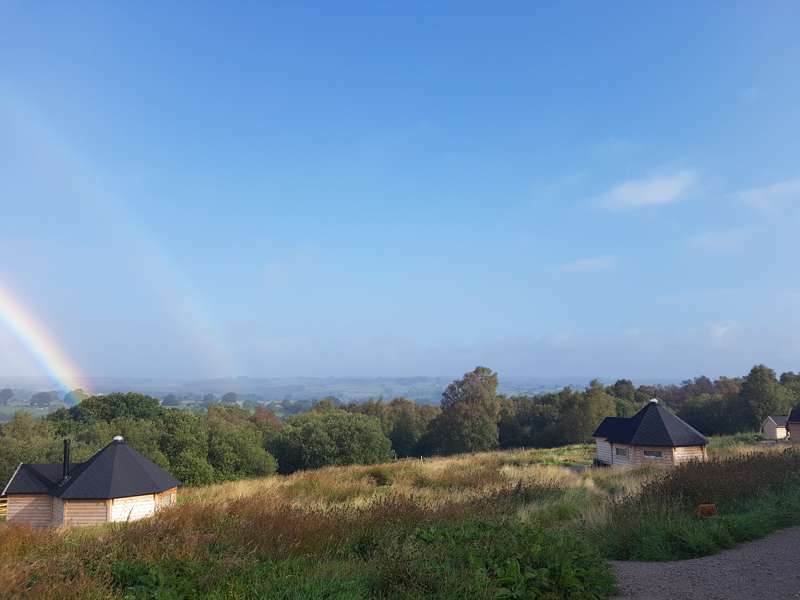 Our travels have taken us all over the UK and we’ve found some pretty impressive glamping sites in North Yorkshire. There are tipis and treehouses, shepherd’s huts and bell tents, cabins and camping pods. 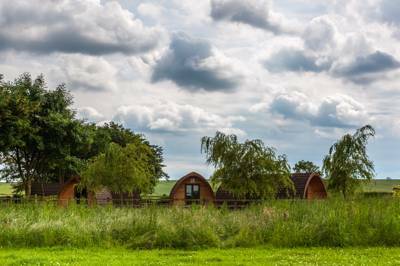 If you like the sound of camping but haven’t got the gear, or simply want to enjoy a bit more comfort on your next camping holiday then glamping in North Yorkshire could be for you. Glamping, or glamourous camping, still gives you the chance to surround yourself with beautiful scenery. You can spend dawn till dusk in the great outdoors and can usually cook and eat over a campfire as you would with classic camping, but you won’t have the hassle of pitching your own tent. It also removes the hassle of cramming the car full of camping gear – only to find you’ve left the tent pegs, can opener or other essential item at home. With glamping, you’ll usually find that all the basics are covered so you can just arrive and start enjoying yourself. The level of luxury and the amount that’s included will depend on the glamping accommodation you choose but the sky’s the limit in today’s glamping world. If you can’t live without the hair straighteners while you’re away, you probably won’t have to as there are places with everything from plug sockets to plasma TVs, heated floors to hot tubs. The Yorkshire Dales is the largest of North Yorkshire’s two national parks at 840-square miles. An upland area of the Pennines, it stretches from the edge of the Lake District National Park, on North Yorkshire’s westernmost edge, right across the backbone of England. It’s an idyllic landscape of limestone outcrops with beautiful grassy valleys or, as they’re properly known, dales in between – each with a river or stream at its heart. Drystone walls, isolated farms and wildflower meadows add to this picture of rural perfection and makes camping here a tempting proposition. It’s no surprise that walking is one of the best ways to see the Dales, with its most beautiful and remote parts, only accessible on foot. You can even take on the Yorkshire Dales’ own three peaks challenge; to climb Pen-y-Ghent, Ingleborough and Whernside in 12 hours or follow a section of the long-distance Coast-to-Coast to walk. Running, mountain biking, horseriding and road cycling are all great ways to explore the landscape too and the Yorkshire Dales Cycle Way offers a 130-mile road route for experienced cyclists. But there’s more to the Dales than initially meets the eye and some of its most exciting features are underground. Water has carved a huge network of caves through the limestone underfoot and it offers some of the best caving in the UK. There are market towns like Richmond, Ripon and Pateley Bridge to visit too along with dozens of charming stone-built villages where Postman Pat would fit right in. North Yorkshire’s wilder side is shown in its second national park, the Yorkshire Moors. More than 540-square miles of heather moorland and woodland is edged by a coastline of cliffs and beaches with quaint fishing villages in between. It’s an internationally important habitat for wildlife with rare plants, insects and birds hidden in the seemingly-endless moors. This is Herriot-country, the area that the author and vet, James Herriot immortalised in his stories including All Creatures Great and Small. You can visit his former home in the village of Thirsk, just outside the national park, and see the view that he claimed was the ‘finest in England’ at the Sutton Bank Escarpment. With views over the Vale of Mowbray and the Vale of York, there’s a national park visitor centre here and it’s a good location to head out on a walk from. It’s also a renowned mountain-biking centre too. 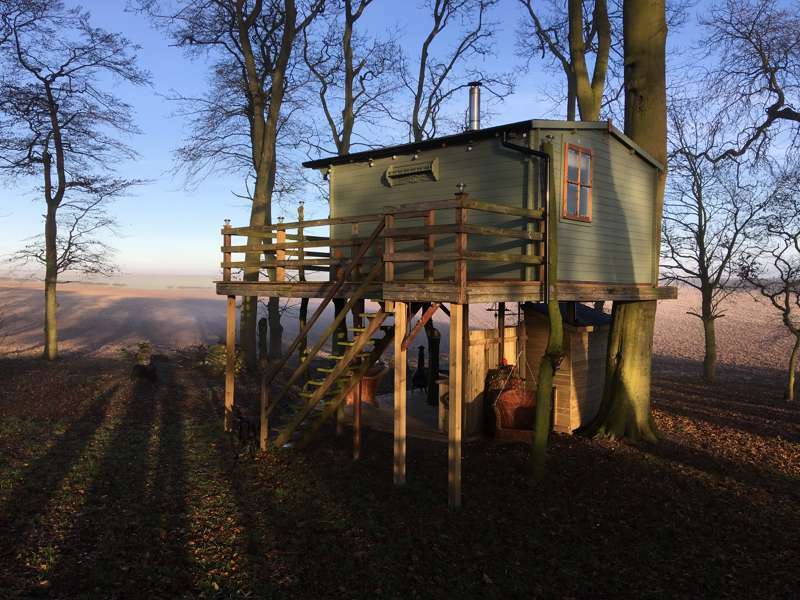 The Howardian Hills in the south is another great place to visit or base yourself during a camping or glamping holiday in the Yorkshire Moors National Park. In addition to the national park status, it’s recognised as an Area of Outstanding Natural Beauty and there are plenty of historic sites within the region. The dramatic scenery of the Yorkshire Moors makes a great backdrop for a camping or glamping holiday. When night falls, things are no less impressive with the vast skies filling with stars, thanks to the lack of light pollution. In fact, Sutton Bank, Danby and Dalby have all been recognised as Dark Sky Discovery Sites. Camping or glamping in these areas gives you the best opportunity of seeing the night sky. The Moors location on the east side of the county also mean it’s a fantastic base if you want to explore the different parts Yorkshire; the quaint fishing villages, beaches and cliffs of the coast are never too far away, York is a few miles south of the park’s edge and there’s not much of a divide between the park’s western edge and the Yorkshire Dales. The coast of North Yorkshire has been tempting visitors since holidays to the seaside were invented. Scarborough is said to be the original seaside resort and has the history to prove it with a Victorian promenade still among its tourist attractions. For a good old-fashioned day by the seaside with deckchairs, beach huts, amusements and fish and chips, Scarborough is a classic location but North Yorkshire’s coast has more to offer too. In addition to Victorian seaside splendour and kiss-me-quick fun, there are traditional fishing villages, great walks and wilder parts of the coast. Almost all of the county’s coastline is within the North York Moors National Park and known as the North Yorkshire and Cleveland Heritage Coast. Its dramatic cliffs include the highest in England at Boulby and provide shelter for idyllic bays and little harbour towns and villages. If tales of smugglers, cobbled streets and fishing heritage interest you, try camping near Whitby, Staithes or Robin Hood Bay, where you can also look for fossils. The North Yorkshire Coast is, in fact, second only to Dorset’s Jurassic Coast in terms of its opportunities for fossil-hunting so if you’ve got an interest in geology or kids who are dino-fans – a few hours at the fossil hotspots of Robin Hood or Runswick Bay will be a few hours well spent. For an overview of the entire coast, you could take a long trek or a series of short walks on The Cleveland Way National Trail which traces almost of North Yorkshire’s coast from Filey in the south to Saltburn-by-the-Sea in the north. 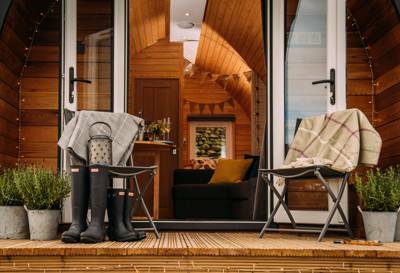 You don’t have to be a walker to enjoy a camping or glamping holiday in Yorkshire – but it helps. There are so many great walking routes and places to visit that are best seen on foot. Whether you decide to camp and walk on the route of one of North Yorkshire’s long-distance paths or pitch up on holiday in a scenic spot, we think you’ll agree that camping and walking go hand in hand. Days exploring the surroundings on foot are perfectly complemented by evenings relaxing on the campsite. If you’re looking to really take on a challenge, you might visit North Yorkshire as part of a long trip along the Coast-to-Coast route, made popular by walker and writer Alfred Wainwright. The almost 200-mile route crosses both the Dales and the Moors as well as the Lake District. It’s legendary finish point is at Robin Hood Bay on the North Yorkshire Coast. Longer still, is the Pennine Way, which crosses North Yorkshire south to north. Its southern end is in Eskdale in the Peak District and its northern end is in the Scottish Borders. It usually takes between 16 and 19 days to walk its 268 miles. The Cleveland Way is North Yorkshire’s other national trail and the only one that is wholly within the county. Cleverly designed to showcase both the coast and the moors, it is 109 miles long and it takes about nine days to walk its entire length. The Yorkshire Wolds National Trail also starts (or finishes, depending on your point of view) in North Yorkshire and traces a route through the rolling hills of the idyllic Yorkshire Wolds. If backpacking and the daily making and breaking of camp is not for you, staying near the national trails still makes sense as you can use them to help plan shorter walks in the Dales, Moors and along the coast. Walking, hiking, biking and generally exploring Yorkshire’s two national parks might provide enough entertainment for the duration of your camping holiday in North Yorkshire but, if not, there are plenty of attractions for days out too. If you’re staying inland, a day at the seaside makes for a great day out – especially in summertime. Try Scarborough for fish and chips, ice creams and arcades or Whitby for cobbled streets and crab fishing. Both have their fair share of historic sites too with Scarborough’s lofty castle ruins and Whitby’s ruined abbey among them. The visitor centre at Sutton Bank is a great central location within the North York Moors National Park and World of James Herriot, just outside it in Thirsk, is a quaint homage to one of Yorkshire’s favourite sons. The city of York has all the attractions and museums you’d expect from the historic heart of the county including, of course, the world-famous York Minster cathedral. There are plenty of independent shops among its narrow and interesting streets and there’s family fun at the Jorvic Viking Centre and the National Railway Museum. The spa town of Harrogate is another popular place to visit in North Yorkshire with its Royal Pump Room Museum and genteel tea rooms. In the Dales, you won’t want to miss a ride on the scenic Settle and Carlisle Railway or a trip to the Wensleydale Visitor Centre to try one of Yorkshire’s best-known exports – Wensleydale cheese. For more inspiration on things to do in North Yorkshire visit the Yorkshire.com tourist information website. North Yorkshire at Campsites in North Yorkshire, Looking for a campsite in North Yorkshire? This specially chosen collection from the Cool Camping guidebook experts includes all the best places to pitch your tent, park up your campervan or even spend a night luxury glamping beneath the stars. Discover the best North Yorkshire campsites here and book online at the best price with Cool Camping’s price-match guarantee.